There is plenty to write home about at the 4 star Azka Hotel in Bodrum. Firstly, there is its stunning beachfront location. Secondly, there are the abundant onsite facilities for all the family. When it comes to swimming and sunbathing, you have got the choice of two pools outdoors and a heated one indoors. Both the sun terraces and the private beach are awash with sunbeds and parasols. On top of all this, there is a lot laid on activity wise and the indulgent spa is a treat for the mind and body. The little ones get a look in too, with two pint sized pools and a playground to burn up some energy. You can dine on a mix of local and international dishes in the main buffet restaurant. Light bites, snacks and beverages are on the menu in the pool bar, snack bar and beach bar. The Lobby Bar is open 24/7, for everything from your early morning espresso to after dinner drinks and nightcaps. The public rooms are light and airy with plenty of seating areas to relax. The stylish guest rooms come with all the latest mod cons, modern bathrooms and a private balcony to watch the sunsets over the bay. Discover why the Azka Hotel is one of the most popular Turkey hotels. 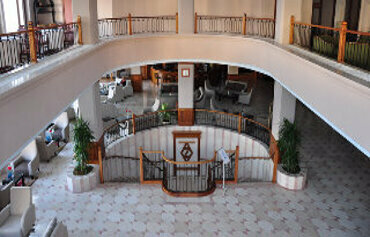 The Azka Hotel has all the facilities you would expect from 4 star hotels in Turkey. Highlights include: Two large outdoor swimming pools with sun terraces, sunbeds and parasols, two kids pools, private 200m sandy blue flag beach, free pool and beach towels, buffet restaurant, snack bar, pool bar, lobby bar, kids playground, 24 hour reception, doctor, car rental, mini market, hairdresser, laundry service, WiFi internet connection in lobby and in rooms. Activities available are tennis, basketball, squash, table tennis, billiards, diving school and fitness centre. The spa offers a Turkish bath, sauna, Jacuzzi and indoor swimming pool, alongside beauty and massage treatments. The hotel has a total of 189 modern and stylish guest rooms. All rooms have a double or twin beds, air conditioning, satellite TV, hairdryer, mini fridge, shower room and balcony. The main restaurant serves up open buffets for breakfast and dinner. Snacks and beverages are available poolside in the Snack Bar and Pool Bar. The Lobby Bar is open 24 hours and offers wonder views, a terrace and a full menu of drinks. The Azka Hotel is located on the beachfront, 1.5kms from Bodrum town centre and 45kms from Bodrum Milas airport.